Once again his brilliant scheme has been thwarted and someone needs to take the blame. Aye, Dark Overlord is fun, fast-paced card game in which you take the role of a hapless servant of the Overlord, making elaborate excuses and outrageous accusations to prove once and for all that it wasn't your fault! Aye, Dark Overlord! 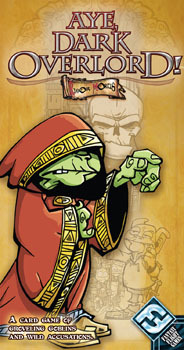 is a fast-paced game of blame, lies, and pitting player against player in an attempt to avoid the Overlord's wrath. This all-new edition from Fantasy Flight Games includes everything from the first release, plus an all-new set of rules, and updated and improved components.